Once again, our blog fell silent for a week as we joined our combined families in our second 1800 mile caravan to the Trans-Pecos region of West Texas. Just like last year, Shelly & I planned to write and schedule posts in advance of our absence and expected to use this "vacation" as an inspirational opportunity for future posts. I guess we didn't learn from last year. If you've ever embarked on a similar journey, you know the amount of preparation and planning that goes into coordinating a driving trip of this length for four families: eight adults and seven children. All of the hustle settles down once we hit the road: the kids chat happily with their cousins, adults swap vehicles during stops, and there is a laughing banter back and forth on the walkie-talkies necessary for keeping in touch between cars. We stayed in the Marathon Motel and Chianti Mountains, before moving down the River Road into Lajitas for some Big Bend hiking and horse riding. 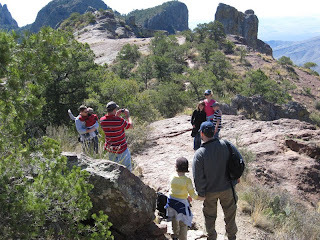 On our last day we stopped in Sonora, where a first day of Spring snowfall caught us unaware as we darted into the Caverns for a short walking tour. Last year my husband fell in love with West Texas and repeatedly announced we would be moving. This year he resumed this mantra as soon as we hit the Davis Mountains. As he announced his plan to move over and over, I grinned from ear to ear. 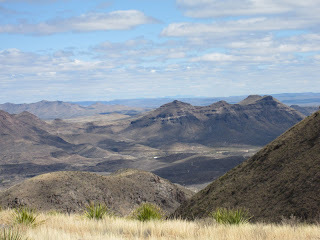 It's hard to visit the West Texas/Trans-Pecos region and not fall in love with this special place. As city girls, visiting this area is an amazing adventure. 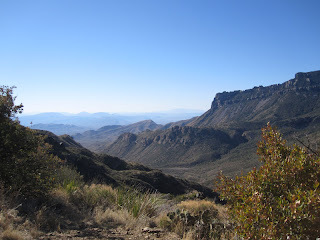 Everywhere you look there are breathtaking views of deserts and mountains, unbelievably blue skies and beautifully rugged individuals whose friendliness surprises even these fellow Texans. Having grown up in the fourth largest city in the U.S., I love imagining what life must be like in these towns with fewer than 1,000 residents. Even the nearest "big" city, an hour away, only boasts 6,000 inhabitants. With few people scattered between these towns, the development of technology keeps them from feeling isolated. Shelly and I feel so extremely blessed to be part of our wonderful family, who embraces the togetherness that comes from sharing 1800 miles over nine days in three minivans. And we are equally blessed to have loving husbands who enjoy our loud, opinionated family even in very close quarters for a week. Hello dear friends... how beautiful it looks on your time away. May it refresh you all. The talk about the walkie talkies reminds me of the time we had two car loads of our family going someplace... I remember seeing a car turning the wrong way on an interstate with us yelling frantically at them on the walkie takie as we went the right way. Great laughs trying to get back together again. Enjoy. Blessings. We had a pretty funny moment ourselves when Lisa and I (riding together) were the only ones to notice the Brewster County Sheriff's car pass our caravan. He made a u-turn and followed for a while, before passing the last two vehicles and pulling over the lead van. We were calling and calling on the walkie-talkies trying to alert the lead driver that he was behind us... to no avail! The officer pulled over the lead van, then pointed to each of us and demanded we pull over as well. Thankfully, he felt a warning sufficed - and then gave us directions to a wonderful restaurant in the next town. I feel God's hand was at work, because when I drove that same stretch of highway later in the trip, I only saw Texas DPS officers and they are NOT KNOWN for their sense of humor or leniency.